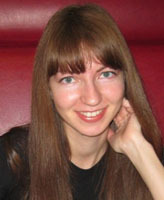 She was born on July 8, 1984 in Perm, Russia. She graduated in Music Theory from the Perm Musical College and in Law from the Nizhny Novgorod Academy of the Internal Affairs Ministry of the Russian Federation. She taught at the Istok Creativity Center. Her first publication was in a newspaper in 2010. Since 2011, she is a member of the Pecari, the Perm Cartoonist Club.